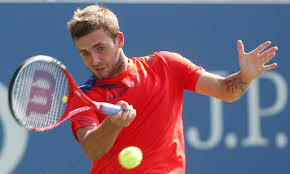 The Sporting Gene – What Can We Learn From Dan Evans? With the recent publication of David Epstein’s “The Sporting Gene” there has been lots of debate essentially over nature versus nurture in sport. The emergence of books like “Bounce” (Matthew Syed), “Talent is Overrated” (Geoff Colvin) and “Outliers: The Story of Success” (Malcolm Gladwell) in recent years has given credence for top performers in sport needing to work hard. The articulation of the 10,000 hour rule, the need to practice for at least that amount of time to achieve elite performance have extolled the work ethic over talent. Epstein’s look at the leading edge of sporting performance takes a contrary view, looking at the evidence that some people are better suited genetically to some sporting activity than others. Of course the truth is probably somewhere in between – that is whatever talent you may have, without hard work it will not result in elite, tournament winning performances. So what has this got to do with Dan Evans? Well he has just had two great results in the first two rounds of the US Open. Having beaten 11th seed Kai Nishikori in the first round, 179th ranked Evans yesterday came from a set down to beat Tomic in four in round two. Evans has been described as one of those talented players who has not fulfilled his promise. He has frequently attracted the wrong kind of publicity, having had his funding withdrawn by the LTA for partying during Wimbledon. At the beginning of last August Evans was ranked just below 400. It’s only this month that his ranking has broken into the top 200 for the first time. Over the last year he has spent most of his time playing ITF Futures tournaments – almost the non-league of professional tennis. As someone put it – here was a player with bags of talent but little application. So what has changed? In two Davis Cup ties over the last year, against Slovakia and Russia, he has won three out of four ties, against higher ranked players, demonstrating his undoubted talent, including winning the deciding rubber against Russia, when Great Britain had been 2-0 down. So a talented player with a reputation for enjoying himself has buckled down and is currently, as he says, reaping the rewards, with at least a $60,000 pay check and a third round match against Tommy Robredo to look forward to. This entry was posted in US Open by aitkenhead. Bookmark the permalink.